This Classic Floss 5 Cotton Candy Machine has a new high-performance head that will not clog like ordinary style heating elements. This cotton candy maker continuously makes the cotton candy for fast delivery. The motor is completely shielded from sugar to extend its life and allow easy clean-up. An all metal design of this cotton candy maker gives you superior durability over using plastic parts. 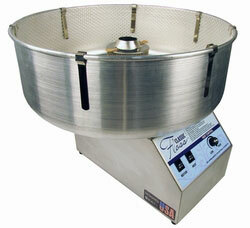 Order your commercial cotton candy machine today! Covered with a three year parts warranty. Metal bowl and Whirl Grip with clips included. Heavy-Duty 1/12 horsepower motor operates at 3400 RPM for fast cotton candy delivery. Whip Grip Floss Stabilizer--prevents the cotton candy from flying out of the pan. Six stainless clips included. 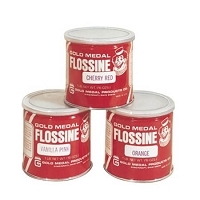 For use with the Aluminum or Non-Metallic floss pan.